The Holy Grail is a dish, plate, stone, or cup that is part of an important theme of Arthurian literature. A grail, wondrous but not explicitly "holy," first appears in Perceval le Gallois, an unfinished romance by Chrétien de Troyes: it is a processional salver used to serve at a feast. Chrétien's story attracted many continuators, translators and interpreters in the later 12th and early 13th centuries, including Wolfram von Eschenbach, who makes the grail a great precious stone that fell from the sky. The Grail legend became interwoven with legends of the Holy Chalice. The connection with Joseph of Arimathea and with vessels associated with the Last Supper and crucifixion of Jesus, dates from Robert de Boron's Joseph d'Arimathie (late 12th century) in which Joseph receives the Grail from an apparition of Jesus and sends it with his followers to Great Britain. Building upon this theme, later writers recounted how Joseph used the Grail to catch Christ's blood while interring him and how he founded a line of guardians to keep it safe in Britain. The legend may combine Christian lore with a Celtic myth of a cauldron endowed with special powers. ﻿The actual Holy Grail may have been found. 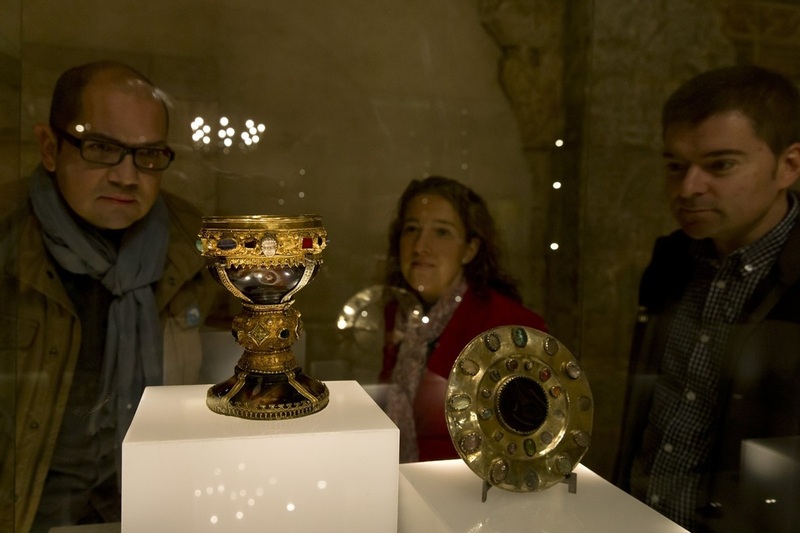 León University medieval history lecturer Margarita Torres and art historian José Manuel Ortega del Rio make the claim in their book "Kings of the Grail," published last week. 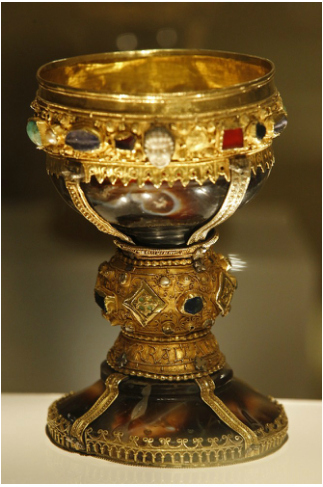 Crowds flocked to see the goblet of the Infanta Doña Urraca in the Basilica of San Isidoro in León, northern Spain once the historians' claim came to light. In 2011, two medieval Egyptian parchments were discovered that mentioned the chalice of Christ, saying it was taken from Jerusalem to Cairo. From there, records show that an emir in Muslim Spain received it as a reward for helping the Egyptians during a famine. Finally, it arrived in Christendom in the 11th century after being presented to King Fernando as a gift. The researchers' investigation "led them to identify the upper part of [the Doña Urraca] goblet, made of agate and missing a fragment as described in the parchments, as the grail," according to the Guardian. The historians have only been able to document the history of this chalice to within 400 years of it's use in the Last Supper. But that takes it back to before the proliferation of 12th and 13th Century forgeries. At the period we know this cup existed, Christianity had been the state religion of Rome for less than 100 years, and the monetary value of such relics was not such as to make forgeries worthwhile.